Whoever receives this child in my name receives me, and whoever receives me receives the one who sent me. TWENTY-SIXTH Sunday: "if your eye causes you to sin, pluck it out"
Some think that the preaching of the Church should not include the mention of hell. The Church requires the priest or deacon to preach on the text of the Scriptures, and in our Gospel not only does the Lord mention the existence of hell, he goes on to describe this state of final and everlasting separation from the love and goodness of God. The Church, in faithfulness to the Lord, teaches about the existence of hell and preaches about it because the Lord himself spoke of its existence. To have a distaste for the discussion of hell or the reality of evil is the choice of the individual. We are called, though, not merely to be good such that we have a distaste for evil or for speaking about it; we are made to be holy as God is holy, and therefore to be satisfied not merely with being good but, much more, to long to be saints. The saints faced the reality of hell by taking responsibility for their moral choices and for availing themselves of Christ's mercy in Confession and the Eucharist on a frequent basis. The Lord teaches the people in our Gospel about the reality of hell in order to inform them that they must take responsibility for their actions and realize that they can choose to be eternally separated from God and all that is good. He teaches that free and wholehearted service to the poor, the hungry and the thirsty are the good works which reflect interior holiness. He teaches that scandalizing those whose faith is weak is a mortal sin, punishable by the greatest of penalties. We are to avoid sin and scandal by rejecting the near occasions of sin. And if we fail to root sin out of our lives, it is by our own choice that we "go to hell, to the unquenchable fire." There is no middle way: we either go to heaven, perhaps by way of a purification from our attachment to sin, called purgatory, or we are consigned to hell "where their worm does not die, and the fire is not quenched. 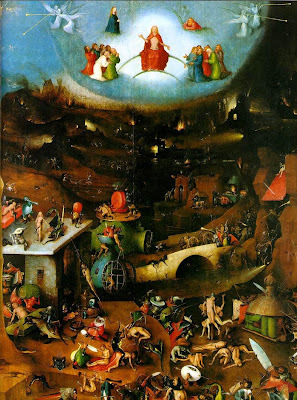 Art: Hieronymus Bosch, Last Judgment. Saturday, 25th Wk: “Pay attention to what I am telling you." ... 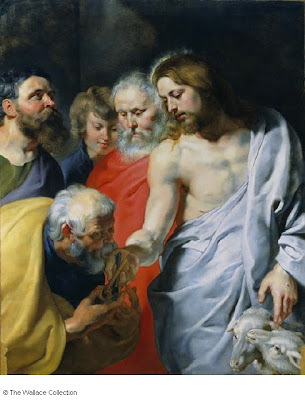 The Son of Man is to be handed over to men.” But they did not understand this saying; its meaning was hidden from them so that they should not understand it, and they were afraid to ask him about this saying. As for the Son, he effects his own Resurrection by virtue of his divine power. Jesus announces that the Son of man will have to suffer much, die, and then rise. Elsewhere he affirms explicitly: "I lay down my life, that I may take it again. . . I have power to lay it down, and I have power to take it again." "We believe that Jesus died and rose again." Friday, 25th Wk: "Jesus was praying in solitude"
Far from having been hostile to the Temple, where he gave the essential part of his teaching, Jesus was willing to pay the Temple-tax, associating with him Peter, whom he had just made the foundation of his future Church. He even identified himself with the Temple by presenting himself as God's definitive dwelling-place among men. Therefore his being put to bodily death presaged the destruction of the Temple, which would manifest the dawning of a new age in the history of salvation: "The hour is coming when neither on this mountain nor in Jerusalem will you worship the Father." Wednesday, 25th Wk: “Take nothing for the journey"
Tuesday 25thWk: "The mother of Jesus and his brothers came to him"
Against this doctrine the objection is sometimes raised that the Bible mentions brothers and sisters of Jesus. The Church has always understood these passages as not referring to other children of the Virgin Mary. 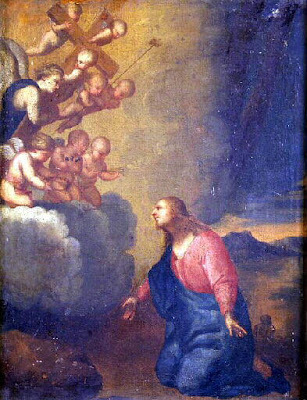 In fact James and Joseph, "brothers of Jesus", are the sons of another Mary, a disciple of Christ, whom St. Matthew significantly calls "the other Mary". They are close relations of Jesus, according to an Old Testament expression. 25th Sunday: "The greatest serves the rest." The way in which a people welcomes the least among them determines their own goodness. 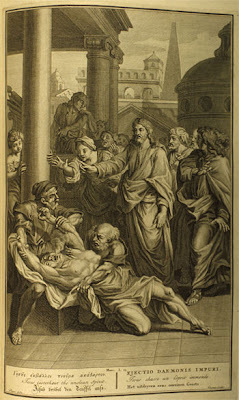 When the Apostles, giving in to pride, begin to argue among themselves as to who among them is the greatest, the Lord calls a child into their midst and thus begins to teach them the contradiction of the Christian life: "If any one would be first, he must be last of all and servant of all." Every one who would be saved must welcome and love the smallest unborn child, the least of the poor, the abandoned, the rejected. This humility and selflessness is a necessity of life in Christ because authentic charity will never fail to inspire it. One cannot love others in the proper way unless one is first prepared to disregard oneself enough to care for and love others by serving them before one serves oneself, by seeing to others' needs before one seeks to satisfy ones' own needs. Charity is evidence of the indwelling of God himself in the person of the Holy Trinity, for "love has been poured forth into our hearts by the Holy Spirit who has been given to us." Friday, 24th Wk: "Jesus journeyed"
By her very mission, "the Church . . . travels the same journey as all humanity and shares the same earthly lot with the world: she is to be a leaven and, as it were, the soul of human society in its renewal by Christ and transformation into the family of God." Missionary endeavor requires patience. It begins with the proclamation of the Gospel to peoples and groups who do not yet believe in Christ, continues with the establishment of Christian communities that are "a sign of God's presence in the world," and leads to the foundation of local churches. It must involve a process of inculturation if the Gospel is to take flesh in each people's culture. There will be times of defeat. "With regard to individuals, groups, and peoples it is only by degrees that [the Church] touches and penetrates them and so receives them into a fullness which is Catholic." This "as" is not unique in Jesus' teaching: "You, therefore, must be perfect, as your heavenly Father is perfect"; "Be merciful, even as your Father is merciful"; "A new commandment I give to you, that you love one another, even as I have loved you, that you also love one another." It is impossible to keep the Lord's commandment by imitating the divine model from outside; there has to be a vital participation, coming from the depths of the heart, in the holiness and the mercy and the love of our God. Only the Spirit by whom we live can make "ours" the same mind that was in Christ Jesus. Then the unity of forgiveness becomes possible and we find ourselves "forgiving one another, as God in Christ forgave" us. Ss. 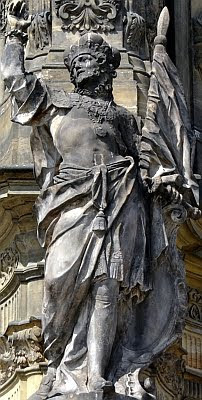 Cornelius & Cyprian: "you should know how to behave"
... in the household of God, which is the church of the living God, the pillar and foundation of truth. Undeniably great is the mystery of devotion, Who 7 was manifested in the flesh, vindicated in the spirit, seen by angels, proclaimed to the Gentiles, believed in throughout the world, taken up in glory. God is infinitely good and all his works are good. Yet no one can escape the experience of suffering or the evils in nature which seem to be linked to the limitations proper to creatures: and above all to the question of moral evil. Where does evil come from? "I sought whence evil comes and there was no solution", said St. Augustine, and his own painful quest would only be resolved by his conversion to the living God. For "the mystery of lawlessness" is clarified only in the light of the "mystery of our religion". The revelation of divine love in Christ manifested at the same time the extent of evil and the superabundance of grace. We must therefore approach the question of the origin of evil by fixing the eyes of our faith on him who alone is its conqueror. 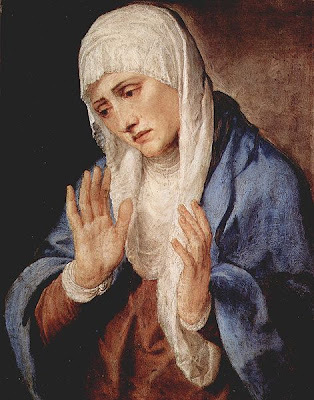 Our Lady of Sorrows: "Standing by the cross of Jesus"
Art: Tiziano, Mater Dolorosa, Museo del Prado. 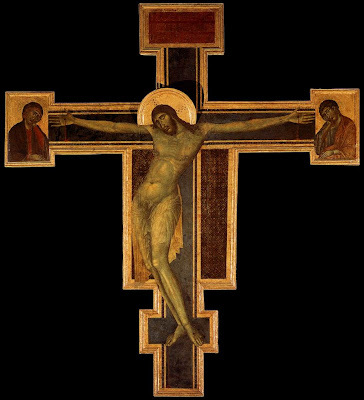 Exaltation of the Holy Cross: "so must the Son of Man be lifted up"
The Word became flesh so that thus we might know God's love: "In this the love of God was made manifest among us, that God sent his only Son into the world, so that we might live through him." "For God so loved the world that he gave his only Son, that whoever believes in him should not perish but have eternal life." Art: Crocifissione, Santa Croce, Firenze. See also "Rebuking Jesus" at A Priest Life. The Church has pored over the Holy Scriptures for nearly two thousand years, and has received the Old Testament from the Jewish people, who themselves have loved and studied the Word of God from the time of Abraham around 1700 BC. Jesus himself interpreted the Scriptures for us, so that we might fully understand that he is Messiah and Lord. His Lordship is established by his victory over sin in his suffering, Passion, death and Resurrection. Our openness to the word of the Scriptures determines how the Lord might reveal himself so as to nurture our relationship with him. Read and ponder the Scriptures daily, particularly hearing with care their proclamation in the sacred Liturgy where Christ truly speaks to us again and again with the desire that we might truly know him. I look forward to meeting you here again next week as, together, we "meet Christ in the liturgy". Saturday, 23d Wk: “A good tree does not bear rotten fruit"
... nor does a rotten tree bear good fruit. Friday, 23d Wk: “Can a blind person guide a blind person?" Jesus scandalized the Pharisees by eating with tax collectors and sinners as familiarly as with themselves. Against those among them "who trusted in themselves that they were righteous and despised others", Jesus affirmed: "I have not come to call the righteous, but sinners to repentance." He went further by proclaiming before the Pharisees that, since sin is universal, those who pretend not to need salvation are blind to themselves. Thursday, 23d Wk: "love your enemies"
Christ died out of love for us, while we were still "enemies." The Lord asks us to love as he does, even our enemies, to make ourselves the neighbor of those farthest away, and to love children and the poor as Christ himself. The Apostle Paul has given an incomparable depiction of charity: "charity is patient and kind, charity is not jealous or boastful; it is not arrogant or rude. Charity does not insist on its own way; it is not irritable or resentful; it does not rejoice at wrong, but rejoices in the right. Charity bears all things, believes all things, hopes all things, endures all things." Wednesday, 23d Wk: “Blessed are you who are poor"
... for the Kingdom of God is yours. Nativity of the Blessed Virgin Mary: "those he foreknew he also predestined to be conformed to the image of his Son"
The "splendor of an entirely unique holiness" by which Mary is "enriched from the first instant of her conception" comes wholly from Christ: she is "redeemed, in a more exalted fashion, by reason of the merits of her Son". The Father blessed Mary more than any other created person "in Christ with every spiritual blessing in the heavenly places" and chose her "in Christ before the foundation of the world, to be holy and blameless before him in love". 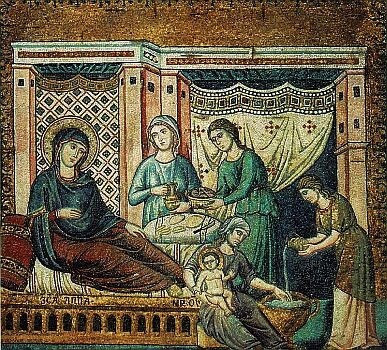 Art: Pietro Cavallini, The Nativity of Mary, 1291. Monday, 23d Wk: "save life"
The Gospels are filled with the evidence of the sacramental system initiated by Christ. As incarnate God he uses physical reality, the gifts of God's creation, as signs to bear the grace of supernatural life. All of creation is wrapped up in the proclamation of redemption. In the Baptismal ritual the priest continues this ordering of creation as a sign of salvation when he repeats the blessing "Ephphatha! Be opened!" over the ears and mouth of the newly baptized child. May the Lord open our ears to truly hear the Gospel and our mouths to proclaim our faith to the glory of God the Father. when he and those who were with him were hungry? Friday, 22d Wk: “Can you make the wedding guests fast while the bridegroom is with them?" To prepare for worthy reception of this sacrament (of the Eucharist), the faithful should observe the fast required in their Church. Bodily demeanor (gestures, clothing) ought to convey the respect, solemnity, and joy of this moment when Christ becomes our guest. Art: Paolo Veronese, The Wedding at Cana. Musée du Louvre, Paris. Saint Gregory the Great: “Put out into deep water"
... and lower your nets for a catch.” Simon said in reply, “Master, we have worked hard all night and have caught nothing, but at your command I will lower the nets.” When they had done this, they caught a great number of fish and their nets were tearing. 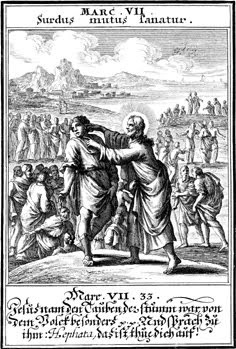 Tuesday, 22d Wk: "there was a man with the spirit of an unclean demon"
When the Church asks publicly and authoritatively in the name of Jesus Christ that a person or object be protected against the power of the Evil One and withdrawn from his dominion, it is called exorcism. Jesus performed exorcisms and from him the Church has received the power and office of exorcizing. In a simple form, exorcism is performed at the celebration of Baptism. The solemn exorcism, called "a major exorcism," can be performed only by a priest and with the permission of the bishop. The priest must proceed with prudence, strictly observing the rules established by the Church. 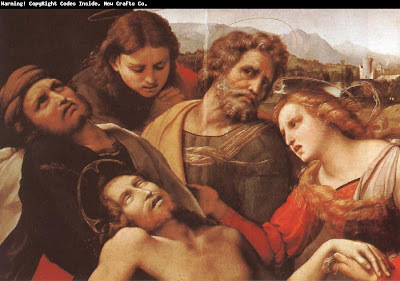 Exorcism is directed at the expulsion of demons or to the liberation from demonic possession through the spiritual authority which Jesus entrusted to his Church. Illness, especially psychological illness, is a very different matter; treating this is the concern of medical science. Therefore, before an exorcism is performed, it is important to ascertain that one is dealing with the presence of the Evil One, and not an illness.